Famous for his illustrations appearing in Octane magazine Guy Allen is now making his prints available for purchase and also does commissioned artwork of owner vehicles too. The artist who seems to have gotten things roling recently has been Michael Goettner of Concepts Illustrated. His first work on the Lamborghini theme is entitled Ground Level Flight and we look forward to his next piece depicting a Diablo. 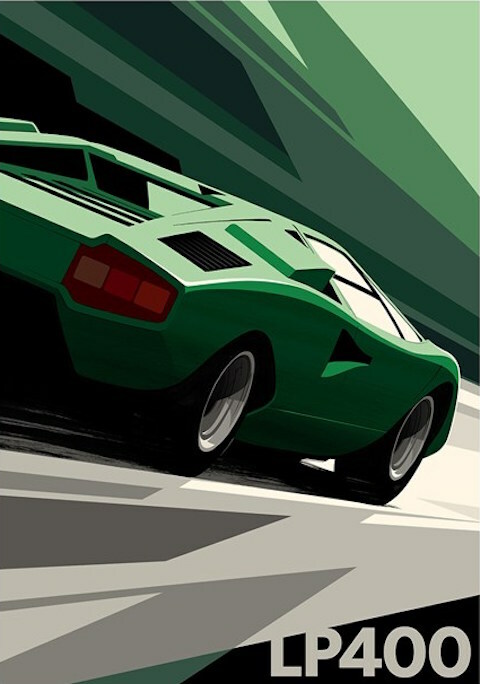 Wings was shown at the '98 Pebble Beach Concours, this exciting painting by wellknown Ferrari artist Jay Koka marks his debut into the world of Lamborghinis. We are quite excited by his presence and hope to see more from him. 4 years since Wings (above) was released has been well worth the wait. Unfortunately, Millenium Diablo was a private commissioned work. Hopefully it will be available as a litho soon. 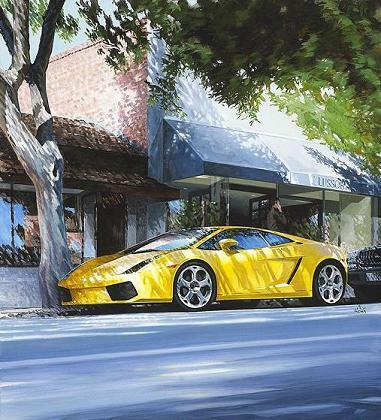 This 2007 painting pictures a yellow Gallardo in front of Lussori in Carmel, CA, USA. 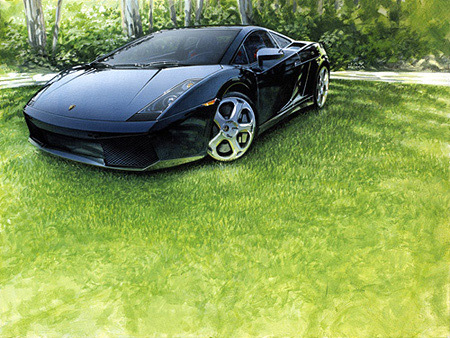 This painting pictures a black Gallardo on the lawn. Prints not yet available. 4407, the ex-Frank Sinatra Miura skillfully captured in this limited edition print currently available through the artist. Reflections on a Diablo by Benito Chavarria. We hope to see more Lamborghinis from him soon. One in a series of Bulls in ink on canvass to be available soon. Miura interior by Hideki Yoshida of Paris. Watercolor of a yellow Miura rotting in a field. Hand drawn Limited Edition Print of Walter Wolf's LP400S. Lamborghini ART? Or Canvass? This painting of Dolphins was done by Christian Reese Lassen on a Diablo SE30 in 1997. Lamborghini ART? Or Canvass? Part 2 - This tribal paint scheme was done by Christian Kastner of Germany, on an early 2wd Diablo.